You can manage the majority of your Connect settings within simPRO. These settings apply to all Connect users. To access your Connect settings in simPRO, go to System > Setup > Mobile, then adjust settings through the General, Pages, and Statuses sub-tabs as required. You can also set up geostamping in simPRO to track where and when field technicians update their mobile job statuses. To manage how an individual Connect device retrieves, sends and displays data, access your Set up Connect within the app. To manage audits in Connect, learn more in Set Up Audits. Adjust general user permissions, runsheet settings and billing settings for Connect in simPRO. These settings apply to all Connect users. This setting is separate from the security group permissions for assigning and transferring stock in simPRO. Select Do not restrict to give Connect users access to stock in all storage devices. Select Restrict to assigned to restrict access to the assigned storage devices in their employee / contractor card files. Select Scheduled and due projects to show both scheduled and due jobs and quotes on the Today runsheet in Connect. Learn more in View the runsheet. Select Only scheduled to show only scheduled jobs and quotes. Jobs or quotes that are assigned but not scheduled only appear in the Today runsheet when their due date is the same as the focus date. Select Enable for jobs and quotes to allow users to Create a job in Connect and Create a quote in Connect. The created jobs or quotes appear in simPRO after syncing. Select Enable for jobs only or Enable quotes only as applicable. Select Disable to prevent Connect users from creating jobs or quotes. Select Schedule to project to schedule travel time to the project as a job cost. Select Do not schedule for travel time to be non-billable. Select Automatically, based on schedule to have Connect update billable labour automatically when a job has been submitted. Select Manually to have Connect users manually update billable labour. Select Enabled to allow technicians to convert their quotes into jobs. Select Disabled if you do not want to allow this. Select Automatically to automatically approve submitted job cards. Select Manually to have job cards manually approved in simPRO. Select Enabled to record the geographical location of a Connect user's mobile status updates, such as starting travel or starting a job. Select Force to prevent users from switching off location services and allow additional time to acquire a geostamp. Learn more in Geostamping settings. Select No to allow employees to retrieve all jobs in Connect. Select Yes to restrict employees from retrieving jobs that are archived or fully invoiced. If you choose to hide invoiced and archived jobs, you can still retrieve partially invoiced jobs. To adjust billing settings in Connect, go to System > Setup > Mobile > General. Select Enable under Mobile Billing and Pricing to allow field technicians to collect payments, view and adjust the quote Pricing page, and convert quotes to jobs in the field. Under the Payment Methods table, select Enable for Connect for the payment methods you want to enable field technicians to collect in the field. These can include simPRO Payments-associated card types. You can control which pages are visible to field technicians using Connect, as well as the order of pages in the workflow and jump menu. Disable unnecessary pages to reduce the number of steps in the workflow, making it faster for your field technicians to complete jobs. To access the jump menu in Connect, access a job or quote from the runsheet, then tap the list icon in the top left. Go to System > Setup > Mobile > Pages. Select Include in Work Flow for the pages you want your field technicians to navigate through when completing a job / quote. Select Include in Jump Menu for the pages you want your field technicians to be able to access through the jump menu. Click and drag the grey drag handle to move pages into the required workflow order. You need to Sync Connect with simPRO to update these changes. If you are unsure about the right mobile job workflow for your business, we recommend starting with our standard workflow and reviewing enabled pages after using Connect. To view the workflow, see Connect Jobs. You cannot remove the Details and Submit pages from the Connect workflow or jump menu. When working through quotes in Connect, the Pricing page always appears after the Details page. The Attachments and Times pages have additional settings. Go to System > Setup > Mobile > Pages > Attachments. Select whether to Make Uploaded Attachments Public. Select whether to Allow Viewing of Private Attachments as defined in simPRO. Go to System > Setup > Mobile > Pages > Times. Under Allow Employee to Specify Overtime, select Yes to let field technicians specify their own overtime in Connect. Enable job and quote statuses for field technicians to update in Connect. You can use mobile status colours to make it easier for field technicians to view status of all the jobs on their Run Sheets. The mobile job statuses can also update the job status in simPRO to reflect the progress of the job according to the automatic triggers set up for Mobile Jobs. Go to System > Setup > Mobile. Go to the Statuses tab. Enter a Name for the status. Select the Job Stage that the job updates to when this status is selected. Select the Job Status Code that the job updates to when the job is selected. Select Start/Continue to begin recording time or continue to record time without stopping. Select Stop to end the time recording. When the technician selects a status that stops recording time, this triggers an alert in simPRO that the job card requires approval. Select Pause to temporarily pause the time recording. When the technician selects a status that pauses time, this does not trigger an alert in simPRO for job card approval. To create a new quote status, go to the Quote sub-tab and follow the same steps. To edit mobile statuses, click the required status and update status details. Note that you cannot change the Name or Time Tracking option of the Completed and Rejected statuses. Click the required trigger in the Mobile Triggers table. Select the Job / Quote Stage. Select the Job / Quote Status Code. To change the order of a Mobile Status in Connect click and move the status using the drag handles. In simPRO, jobs with multiple cost centres can have each cost centre set to a different stage and status. In Connect, statuses always apply to the job as a whole, so when one cost centre is updated in Connect, this can affect the whole job depending on how your statuses are set up. It is recommended that you create status codes that are specific for mobile users, so you can easily distinguish if a job has been updated from a mobile device. Learn more in Create a status code. Remove individual mobile statuses from appearing on Connect by clicking the delete icon. The Completed and Rejected statuses cannot be deleted. The way your status codes are positioned, under System > Setup > System Setup > Status Codes > Status Codes, determines their status priority. Status codes at the bottom of the list will trigger first and status codes at the top of the list will trigger after. You can ignore status and automatic trigger priority for Connect by selecting Ignore Status Priority. This way, when a technician triggers status codes in the field, the status is automatically changed to that status regardless of priority. Use geostamping for GPS-enabled Connect devices to know where and when your field technicians updated their mobile job and quote statuses. To enable Connect geostamping in simPRO, go to System > Setup > Mobile > Geostamping and select Enabled. Select Force to prevent field technicians from progressing through the workflow or updating the job or quote status if their device's location services are disabled or unavailable. This also allows extra time to acquire a signal for the device. It is not recommended to enable Force mode for Geostamping if users frequently operate in remote areas with poor signals. Once geostamping is enabled, you can view geostamped mobile status updates for multiple jobs and quotes in the Status Log. To view the mobile status updates for a specific job, go to the Mobile tab in a job card or the Schedule tab in a job. The size of the circle on the map represents the accuracy of the geostamp, which can be affected by the strength of your network signal. You can adjust the status colour of the circle in your Set up Connect statuses. Use in-app settings in Connect to manage what type of data your Connect device retrieves. You can also use the settings page to find information about your device's sync operations as well as the current version, server and user. To access in-app settings, go to the Connect dashboard, then tap Settings. Alternatively, if you have not logged in to Connect, tap Settings on the login page. You can change the default language in which you view Connect to proceed through the workflow more efficiently. You can change the default language that you view in Connect in the employee card in simPRO. Learn more in Adjust employee settings. Alternatively, set your default language in Connect by going to Settings > Language, then selecting the language from the drop-down list. When you change the default language in Connect, your changes reflect in simPRO, and vice versa. The login screen remains in English. 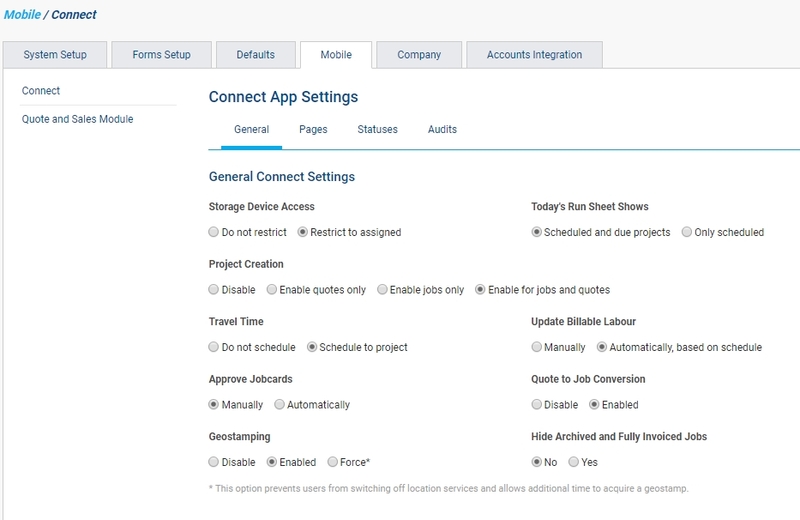 To manage which jobs, quotes and tasks are available when you View the runsheet, you need to set up what data your Connect device retrieves from simPRO. View all outstanding assigned or scheduled jobs and quotes. View all outstanding, completed and invoiced jobs and quotes that you have been assigned or scheduled to. Completed and invoiced jobs and quotes appear in your Other runsheet. View all outstanding, completed, invoiced and archived jobs and quotes, you have been assigned or scheduled to regardless of date. Completed, invoiced and archived jobs and quotes appear in your Other runsheet. To view only outstanding assigned jobs and quotes, select Pending and Progress from the drop-down list, then select Also retrieve all pending/progress (Jobs / Quotes / Tasks) for other days. Your pending and progress jobs or quotes due or scheduled for dates other than the specified focus date appear in your All runsheet. When you select Also retrieve all pending/progress (Jobs / Quotes / Tasks) for other days, the Other runsheet is called the All runsheet. For information on troubleshooting data retrieval issues in Connect, see Connect Troubleshooting. Select 48hr Scheduling to display all scheduled jobs or quotes within a 48-hour period of time when you View the runsheet for a 48-hour period, for example, if you have a night shift scheduled. When you have finished setting up your data retrieval options, tap Finished to have Connect Sync in the background. Manage your Sync Operations to monitor how Connect operates on your device. Tap Go Offline, then Finished to use Connect without an internet connection. This option is useful when Connect cannot perform a sync due to an unreliable internet connection, for example, when a field technician is working on a job site in a remote area with poor mobile coverage. When you use Connect in offline mode, all data is stored on the device while you work in existing jobs and quotes. You cannot sync updated data to simPRO, request a purchase order, or create jobs, quotes or activities in offline mode. To allow the app to connect to the internet and sync with simPRO, tap Go Online, then Finished and Connect automatically syncs all updated data. Tap View Log to view a log of app activity. If you are working with simPRO Support to resolve any issues you are having with Connect, you may need to send a copy of the log by tapping Post. Tap Reset Database to delete all data from Connect and log out the current user. If you are working with simPRO Support to resolve issues with corrupt data, you may need to tap this option. Various functionalities are restricted when you Work offline in Connect. The current version of Connect used on the device. You need to access your device's app store to ensure you are using the latest version of Connect. The simPRO build that the app is connected to and syncing with. The current user's name, or, if viewing Connect settings while logged out of the app, the name of the last user to have logged in. A timestamp of the most recently recorded sync between Connect and simPRO. Indicates whether there is data that needs to be synced with simPRO. The mobile device type and operating system.